Summary: You can build a new home for less than $70,000 with careful selection of house size and design. Carl, I’ve been a carpenter for over 25 years and my question to you is, can I realistically build a home for $70,000? I have $70,000 from the sale of my prior home and I own the land free & clear (no loan). I do not want to spend a penny more than the $70,000 as I want no debt. The only labor I would need to hire more than likely is for the electrical and HVAC. Earl, not only should you be able to build a new house for less than $70,000, you should be able to have it built for you using professional subcontractors. This attractive 800 sq ft home makes use of roof trusses with an overhanging roof line to add even more usable outdoor space. 800 square feet may not sound like a big house, but it’s bigger than you’d think and quite livable. 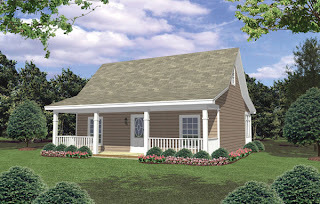 Using the construction estimate software, I ran a cost to build estimate on this 800 square foot new home plan that I found on Cool House Plans. rural area in Bakersfield CA. The estimated cost to build this house came out to be approximately $66,599 ($83.24 per sq ft), including all the labor to build it. It does not include a General Contractor markup because you will be the General Contractor. Nor does it include, city or county impact fees (if any), land, or land development costs. Well Earl, subtract the labor costs you won’t be needing if you will be doing that labor, and any other costs you think you won’t need to budget for and you should have a enough money to not only build this house, but be able to add a garage and a few other amenities…perhaps even afford ICFs. Keep in mind that this is an approximate estimate for 2019. Until you get actual bids for contractor labor, subcontractor labor and building materials it will remain approximate. Build Your Own House - How to Build a House and Save Money - Be Your Own General Contractor.